First Line: For some reason, she stopped in the middle of the wooden bridge and clutched her wicker basket closer to her chest. 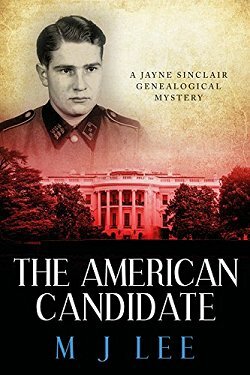 When genealogist Jayne Sinclair is hired to research the family history of a potential candidate to be President of the United States, she is immediately plunged into danger. The man who commissioned the research is shot dead in front of her, and now Jayne is forced to run for her life. Why was the man killed? Who is trying to stop the American candidate's family past from being revealed? This is something Jayne must find out, all while trying to stay alive. Although The American Candidate is the third book in a series, it can easily be read as a standalone-- and I know that matters to some readers who don't necessarily want to "sign up" for a series. I have enjoyed every book so far, and that's primarily due to the main character, Jayne Sinclair. She's a former police officer, and that training and background serve her well not only in pursuing her investigations but whenever her assignments put her in danger. There is plenty of danger in this book as Jayne is forced to go underground in Manchester-- the city she considers her home turf. The two timelines work together well: the present day and the second during World War II. In fact, the World War II timeline brought to light some things that I was unaware of, but I'm not going to go into any detail because once I start, I may give something away. If you have the slightest interest in history, in fast-paced mysteries, and in strong, intelligent female characters, you should give M.J. Lee's Jayne Sinclair series a try. These books are really good. Oh, mix of politics and mystery, Cathy - I like it! And the genealogy fascinates me, too. Glad you enjoyed it. This series is very well done, Margot. I remember when you read earlier books in the series and I also remember thinking they would suit me. I didn't note the author down. I'm doing that now because I think they would suit me - yet again. Ha! Glad you are liking them. I think you'd probably like them, Kay, so I'm glad you made a note of the author's name.